Two designers behind the iconic railway-turned-park discuss how it ushered in a new era of landscape design. The High Line, Manhattan’s elevated railway-turned-park, now attracts six million visitors a year. As it approaches its seventh year as one of the world’s most identifiable public spaces, it’s come a long way for a piece of infrastructure marked for demolition not long ago. Designed by James Corner Field Operations and Diller Scofidio+Renfro, the High Line’s success has ushered in a new wave of park design that either reuse neglected trails and bridges or create new ones for the same effect. Around the world, at least 60 different projects that are either being planned, are under construction, or have been completed cite the High Line as an influence, according to the two firms. Constructed in the 1930s to bring cargo to warehouses and factories by train, the line began a slide into irrelevance in the 1950s as trucking replaced freight rail. In 1960, the southernmost portion of the rail line was demolished. In 1980, what remained of it hosted one last train ride as the Meatpacking district below it transformed into a hotspot for nightlife and art galleries. Map showing specialized markets on the West Side of Lower Manhattan served by the New York Central Railroad. City of New York Department of Docks and Ferries, May 7, 1912. Tranquil and verdant in its abandonment, the High Line became a subject of fascination for the few who either knew how to get up there or could see it from their window. Joshua David and Robert Hammond, two nearby residents who wanted to see it transformed into a park, formed Friends of the High Line in 1999. Rudy Giuliani signed an order for the High Line’s demolition in his final days as mayor in 2001. That order was successfully challenged by Friends of the High Line. 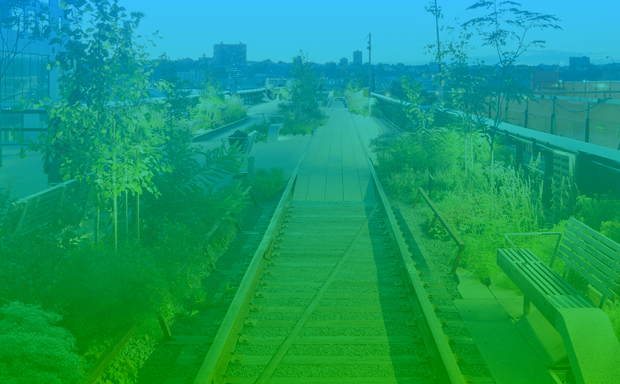 After the economic feasibility of designs for the site were proven, Giuliani’s successor Michael Bloomberg officially embraced plans to turn the High Line into a park in 2002. CSX Transportation donated ownership of the High Line to the city in 2005, and a groundbreaking followed in 2006. Today, it’s hard to imagine such a protracted struggle was necessary. A typical visit may even make you wish the High Line was still a secret. The 1.45-mile park’s constantly varying layout, intricate landscaping, and stellar views create one of the most stimulating public spaces on earth—best enjoyed when you’re not trying to pass other users on its narrowest stretches. New crowds aren’t limited to the park. Real estate values have soared around the High Line since it first opened as a park in 2009. A neighborhood once full of blue-collar workers, artists, and low income residents is now losing its charm to aggressive development. The underlying concept behind the High Line—converting a disused rail corridor into a welcoming public space—didn’t come out of nowhere. Developers may be as pleased with the High Line’s transformation as the average visitor, but an exceptionally popular park is hardly the root cause of gentrification in a city that struggles to protect its most vulnerable residents from it. The mass appeal of its design actually suggests there aren’t enough places like it. The two firms behind the High Line have teamed up for a look back at how the park came to be and how users respond to it in a new book, The High Line (Phaidon). Beautifully laid out, the new book uses architectural plans, photography, cultural ephemera, and interviews with the design team to explain the site’s transformation in 452 pages. CityLab spoke with Lisa Switkin of James Corner Field Operations and Matthew Johnson of Diller Scofidio+Renfro about their own history with the High Line and how it has changed their work since. What did you know about the High Line before working on the project? Lisa Switkin: I have a very long history with the High Line. When I was in school doing my masters in landscape architecture, it was one of my last bodies of work and I think at that point it was truly seen as a liability in New York. It was something that was dark and haunting, and you couldn’t actually get on top of it. So we’d try to find places to go to their rooftops and take a look at it, or meet people who had access to it some way or another. Really, the perception I had of it was from below, not above. At the time, I was looking at it more as a sort of neighborhood connector, looking at the different neighborhoods that it passed through and its actual connection to some of the large public housing units around the area. People forget about those now because of all the luxury condos coming up, but you still have the Chelsea-Elliott houses and a significant amount of affordable housing in the neighborhood. I was looking at the Fulton Houses and the Chelsea-Elliott houses and the High Line and thinking about the larger potential for it to really connect. It was more in the urban design realm and thinking about it as an artery that way. Even today, it crosses through three neighborhoods that are still quite distinct. There’s the historic Meatpacking District, which, when I was first looking at the High Line, wasn’t officially a historic district yet. Florent was there and a few other places, but now it’s much more established. There was an eclectic mix of fashion and transvestite-scene clubs and bars as well as meatpacking. The whole area felt very different. You could sort of see the start of things changing, you could tell it was in the early stages of transition, but it was still very much a transitional neighborhood [in 1999-2000]. In West Chelsea, there was some of the residential [housing] that’s east of 10th Avenue. There wasn’t a lot of it on 10th or to the west, but there were the galleries, The Kitchen, and the Dia Center. And Hudson Yards was really nothing. Now that’s becoming a new Midtown neighborhood, and it was pretty blown out. When you hit that part of the West Side it felt like there wasn’t much around. Matthew Johnson: The neighborhood was a place I’d end up in mostly for galleries and nightlife, always ending up at Florent. When we were reflecting on this [project for the book], I started to think back about what I had read about the neighborhood, especially about the Meatpacking District and all the cultures in the neighborhood: The meatpackers, the artists, the fashionistas, the club culture, and the subcultures of the community. I knew that Lisa had the High Line as her thesis, and I was aware of it in an abstract sense—I had seen images and early studies by Steven Holl—but I didn’t know what it was. I did spend time in Chelsea, but the High Line had a stealthiness to it. Half the time, you’d only see it because you were underneath it, mostly because it was covered in billboards. You’d walk by it on the way to galleries. But I didn’t become that aware of it until we [DS+R] got involved in the [design] competitions. How did people access the High Line back then? MJ: It’s hard to say because the way I discovered you could get up there was [learning] that the High Line unexpectedly starts to grade at 34th street. There’s a parking area for trucks at Javits Center that didn’t have good security. When we were exploring there, we found spots along the way where people could access it. Someone even had a garden with a Christmas tree up there. LS: It’s interesting. Talking to different people about the High Line and that time, some people were like, “I lived in that area and I had no idea it was even there.” I mean, it was meant to disappear and recede in the city, it wasn’t meant to show itself. And then there’s a few other people who are like, “that’s my favorite place in New York!” Most of them would trespass. Next to it, you would see these makeshift drawbridges or they just happened to have a building that overlooked it so they knew of it and saw the more opportunistic side of the High Line, the grasses and weeds taking over this piece of infrastructure. I went on the top of The Kitchen at one point to take photographs on their rooftop. They allowed me to go up. Other than that it was difficult to find access without actually trespassing. How did you approach the idea of creating something new but “authentic”? LS: It was hard. Most of us fell in love with the sort of unofficial space of the High Line. It had a spirit and mystery to it. Even when we were allowed to be up there, there was still this sensibility of being in another world. That was magical. Part of it is just being lifted up from the street, an insulated feeling, and being able to see a part of the city that you don’t usually see in a close-up and personal context. At the same time, we knew all of the regulations and all the other things that were going to have to go into making it “official.” I still think part of it is just the nature of the structure itself and how it weaves between mid-block and between buildings, so that mystery is still there. I think even when you’re up there today, there are lots of people and everything else, but you still get this authentic view or an inner view of New York that you don’t get from any other perspective. There’s this kind of mantra, a mission—and it helped us to practice restraint. There were a lot of pressures, especially early on, that we needed to do a lot more in order to attract people to come up to the High Line. There were earlier proposals that were much more built up, bigger moves that were drawing more attention, attractions, and we kept being like, “look, it’s an attraction in and of itself being up there, getting this perspective and seeing the city and the mix and variety of the city itself is part of the attraction. It’s a dialogue with the city.” I do think that kind of helped us to hold back a bit and make sure we didn’t lose the essence of what it was, because we didn’t it to become just another public street. We really wanted it to feel different, and the whole idea of the wildness and the slowness and these other things really helped us to go back to those ideas and make sure that we weren’t overdoing it. Because it would have been very easy to over-design the High Line and ruin that experience. MJ: I think it was through a lot of restraint. Initially we were maybe looking at it through lens of designers where you feel like you need to make big moves to get the attention of jurors. We were proposing bigger moves like a beach and an outdoor movie grandstand which we ultimately decided could overwhelm the High Line. The beauty of it was that it had an amazing vantage point of city though a discarded piece of infrastructure that helped frame its context, and we didn’t want anything blocking it. We wanted to keep the toughness of it in the way we detailed it, particularly the paving system, and capture the spirit of it. The paving system was our eureka moment early in the competition, something we kept going back to as we continued through design process. Every once in a awhile we’d deviate from it before coming back to it again. Were you seeing that in other proposals from different firms? LS: For the competition, there were four firms that competed, and we took a very clear stance that we were somewhere between total transformation and total preservation. We weren’t naive enough to say “just leave it as it is, and it will be fine” because we knew all the upgrades that would have to happen in order to make it a public space. But we also didn’t want to obliterate what was there. We were very much inspired by and respected the history of it as a working rail line and as an abandoned landscape. In the four competition proposals, there was one by Zaha Hadid, which was a total transformation; there was one led by Michael van Valkenburgh’s office, which was leaning towards a more preservationist attitude; there was a Steven Holl one, which was also more of a total transformation; and then there was our proposal, which really tried to strike this balance. And that’s one of the reasons that we were selected, because it resonated with the jury that we both had a deep admiration for the place and the site, while at the same time seeing the potential to bring new life to it. MJ: The unique thing for us is we wanted to have a consistent language throughout the park. Any deviation had to be natural to the context and respond to the urban fabric. Similar projects have come up around the country since. Are you seeing projects that do that well or projects that miss the point? MJ: To be honest, I haven’t researched them, but I know there are a lot out there. I do think that they’re based on need: There’s the Bloomingdale trail in Chicago. It’s a different kind of condition because it serves a more residential area. It’s a different scale and it accommodates bikes. Having that brings in whole new sets of opportunities. LS: The ones that just try to copy and paste are the ones that are the least successful. Our whole strategy was to both leverage and amplify what was there. Even though it is something that can be emulated, it was so specific to its place and it was designed as a choreography with its place, with its city, with all these other things. It has its own constraints and issues, and it’s in the middle of New York City. It’s very different from these other projects that are in suburban areas or have a wildly different context. The ones that are inspired by just the idea of looking at underutilized infrastructure or looking at leftover spaces are the ones I feel very proud of, that it’s helped people to think about what assets they have and instead of just ripping it down, thinking about how they could reuse them or bring new life to them. The ones that are more like, “I want a High Line because I want a High Line,” those are less appealing and usually less successful. Or ones that even want to build a whole new High Line without even preserving an existing structure. The Belt Line, the Bloomingdale Trail, the Reading Viaduct, they’re all radically different contexts, and the best thing is to look at the uniqueness of whatever it is that you’re looking at and figure out a way to pull that out from the place. Are there instances of clients asking for a replica of the High Line? MJ: Yes. It happens more often than not. Even projects that have nothing to do with old buildings, they still want something like that. Sometimes it goes, “I want an elevated park structure” and sometimes it’s [asking for something that has] the spirit of it. With clients looking to adapt an existing piece of infrastructure, we tell them that the High Line is very unique and conceived of directly in relation to its context. It wasn’t something we imposed on it. Anything we do like that has to grow out of a new context. What about the High Line’s cultural relevance today surprises you? LS: We knew and saw the potential of it, and we were excited by that. But I don’t think any of us expected it to be what it is today in terms of its impact. Especially how fast it has happened. I’ve been working on the project since 2004. That’s 11 years now, which seems like a long time to work on a project, but when you think of the transformation from a liability to an icon—11 years is nothing. Over 6 million people a year visit now, and when we started they were like “maybe 300,000.” We got questions like, “Who’s gonna go up there? No one’s gonna go up there!” Just that shift has been dramatic. We work in the public realm, and with most of our projects you have to have a pretty wide imagination to think of how they can change. But I don’t think that we estimated the level of impact, success, or popularity that it would have. MJ: We’re all sort of shocked. Naively, we were thinking of the park as something for the community, something specifically for the neighborhoods that it stitched together. When we were originally looking at plant species, we were also looking at people species. It was very different back then. It’s funny that the one species that we left off was tourists; we had no idea that it’d become that kind of place. LS: There isn’t anything I can put my finger on. A lot of people say, “There’s so many people now. Would you have designed it differently for larger crowds?” But the fact of the matter is that there’s a delicate balance of it being both a garden and an immersive landscape experience as well as a promenade with all these things. Yeah, you could pave it edge to edge, but it wouldn’t have any of the magic that it has now. In some ways I feel like if we would have known, we might have done things differently. But I don’t know that it would have had a better outcome. Very early on, we talked about it much more as an atmosphere, an environment and a stage, all these different things, and I think that’s part of what’s appealing about it. I think if you tried too hard to accommodate visitation and programs and these other things that it actually would have become too scripted. MJ: I don’t know that there’d be anything we’d do differently. We wanted the High Line to be independent from anything around it. The only time it engages with other development is when it contributes back to the High Line. There are no locations where there’s a direct connection from the buildings around it to the High Line. Even if something’s adjacent those residents still have to come out to street to take public access up there. In general, there’s a sense that we’re done—but we’re still designing. We still have a new section of phase three that we’re working on, which extends east from the intersection of the second and third part of the High Line that goes over [10th] Avenue. And we’ll still come back and design for [West Side Railyard], which is being left in a raw state until development happens there.